As with any other academic discipline, psychology contains it's fair share of subject specific language, terminology and jargon. The aim of this page, therfore, is to provide links to the best free online psychology dictionaries and psychology glossaries. AllPsych Online is one of the largest and most comprehensive psychology websites on the Internet. 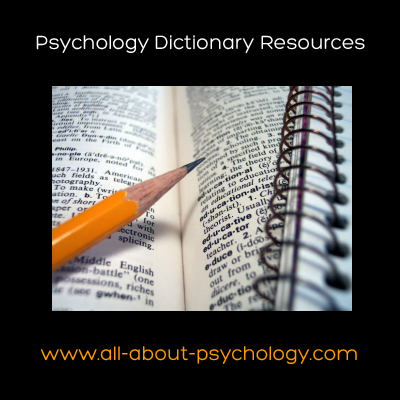 It's recently revised online psychology dictionary defines and provides examples for 521 psychology related terms. Click Here to see the online psychology dictionary. Gerry Keegan BA (Hons) LLB MSc is Assistant Head of Faculty for Arts and Social Science and teaches at Kilmarnock College, Ayrshire. He has developed, taught and assessed psychology in Scotland for nearly 25 years. Included on his very useful website is a glossary of psychological terms and a specialist glossary relating to psychology research reports. Click Here to visit the glossary page. This excellent psychology and mental health sciences related dictionary was developed by staff at the ITS Tutorial School in Hong Kong and was edited by Lucinda Pike. All of the featured definitions (over 1200 of them) are cross referenced and linked for ease of use and cover most of the major terms and concepts that students will encounter when studying psychology. You can access this extremely useful resource by clicking on the following link. 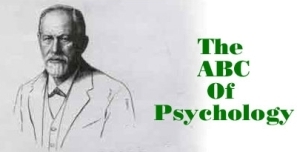 Currently marking 114 years since its founding in 1892, the APA is recognized, nationally and internationally, as the largest professional organization of psychologists in the world, as the source of the premier electronic reference database resources in the field, and as a major scholarly periodical and book publisher. 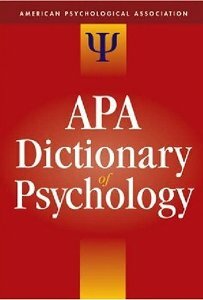 Having contributed so much for so long to the development of the lexicon of psychology, APA has long envisioned the compilation and publication of its own dictionary. Most recently in the past 10 years, APA Books has been involved in a major scholarly and editorial undertaking to bring the APA Dictionary not just to APA members, but also to psychology students, allied behavioral health professionals, and the general public. Under the guidance of an editorial board of nearly 100 scholars, researchers, and practitioners, APA reference editorial staff has worked in concert with Market House Books, Ltd.— an English firm with over 30 years’ experience in compiling reference books for both British and American markets — to bring out this invaluable addition to your reference shelf. 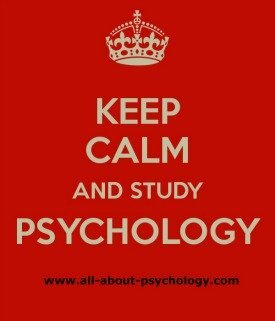 Academicians, researchers, clinicians • Undergraduates, psych majors, graduate students, and post-grads • Allied mental health professionals, including psychiatrists, social workers, and counselors • Professionals in education, medicine, and law • Academic and public libraries • All readers with a general interest in psychology. What Features Will You Find? 25,000 terms and definitions encompassing such areas of research and application as personality, development, interpersonal relations, memory, motivation, perception, cognition, language and communication, among others • Coverage of psychological concepts, processes, and therapies across all the major subdisciplines of psychology — including clinical, experimental, social, developmental, personality, school and educational, industrial and organizational, health, among many others • Thousands of cross-references, directing the user to synonyms and antonyms, acronyms and abbreviations, related terms and concepts • A Guide to Use, explaining formal elements and editorial practices • Four Appendixes, each gathering entries thematically into one synoptic listing, covering biographies; institutions, associations, and organizations; psychological therapies and interventions; and psychological tests and assessment instruments.